One of the most common procedures for males in the Roseville, Folsom, Stockton, Elk Grove areas is liposuction. Using tumescent anesthesia and VASER (Vibrational Amplification of Sound Energy at Resonance) Dr Charles Perry, Medical Director of Chrysalis Cosmetics, has been able to perform liposuction without anesthesia in the office. Some male patients are experiencing minimal to no downtime. 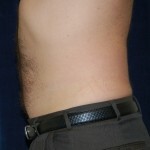 For example the patient pictured here was bothered by the extra fat around the belly button. Despite exercising, dieting, and running the area seemed to stay the same. After a consultation and reviewing the health history and risks of the procedure the male patient decided to proceed with liposuction to contour this one resistant area. Once the tumescent liposuction fluid was inserted the Vaser was used to emulsify and the fat selectively and then heat the skin to help with contraction of skin as well. 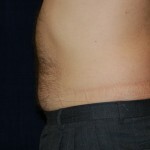 Using small cannulas hidden through the belly button – 250 cc of pure fat was removed. The patient then wore a compression garment for a week. He went back to work the next day and resumed his exercise routine the following week. These photos are from one week following the surgery. He is very happy with all the results and has had to change his pant size by 2 inches! Vaser Tumescent liposuction is a great way to enhance your contour.